The Lost Waves of Time (TLWOT) is one of those truly unique books that can alter your world-view. Unlike anything you have read before, it reveals an amazing history of ancient cultures, where music was wielded as a secret weapon. You will find a wealth of specific information - detailing how masters and leaders across the ages utilized sound energy in the form of exquisitely precise music. The ultimate achievement of this secret was the ancients' ability to shape their people - their emotional, intellectual and value decisions - and as a result control the entire culture via their culture's signature music. We see this power - the manipulation of the sound vibrational environment of a civilization - used to remarkable effect again and again, from ancient Sumeria and China to Egypt and India. We travel through all ages and even discuss the role of music in modern times. The Lost Waves of Time is tremendous in scope, presenting a clear account of how spirit first involved into the material world. A constant theme explains how subtle energy connects the realms of body, mind and spirit. The volume is well researched and lists an impressive of references. It is filled with secret knowledge, unassumingly shared, so we common mortals can know these ancient secrets. The wisdom from our past is made vibrant using today’s nomenclature; not an easy task. This book is sure to become a classic in many fields of study: music, math, healing, human potential, frequency, ancient knowledge, sound, light, architecture, and more. The book can be enjoyed as a history of ancient civilizations with unique facts and theories. It is also a course in the history of music and probably most importantly an attempt to connect many religious and spiritual traditions; in the process a wonderful new paradigm for our spiritual heritage and ultimate destiny is presented. Prepare for a ride through history in a way that will move you to your core. You will recognize information from a deeper inner place that you likely didn't know even existed within you. This work will forever enlighten your perceptions and understanding of music and ancient people! From the mythic days of Atlantis through all the histories of the major civilizations, an idea echoes around the ancient world; the vibrational power of music slowly shapes human emotions, behaviors and actions. These influences accumulate and solidify, resulting in entire cultural reform. Like the slow erosion of a tall mountain into a gentle rolling hill, music's subtle energy relentlessly molds everything in its path. Music has always molded our world - much more than we can imagine. The mirror of music reflects a culture's deepest social and moral values. Using their understanding of music's power - ancient man shaped his world and maintained his creation for millennia. Pliable music was the foremost ancient tool to perform unbelievable feats. Adventure into our distant past and watch the waves of music endow people with experiences and emotions. From legends of Atlantis to written history of the magical use of music, the history of music as a tool to change reality will be revealed. 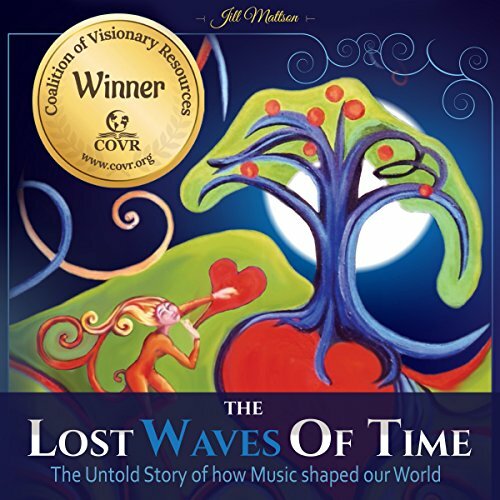 Three time author Jill Mattson breaks through in The Lost Waves of Time, revealing ancient vibrational energy techniques for sublime results. Enormous in scope. Reach new levels of consciousness. It will alter your ideas of sound and the ancient world – forever! Jill Mattson is a researcher, writer, musical artist of great depth and sincerity. In a time when our adolescent modern society yearns for spiritual and academic truth, let her years of knowledge and enlightenment awaken you to your greatest inner potentials and our communities to their spiritual responsibilities! A great shame that somebody thought Wayne Lee could narrate this wonderful book. I am sure it is a wonderful book. The world has been waiting for this fascinating content. As far as I know, I can't speed up iRene iPod, so I will have to bail and buy the print book. Wayne Lee seems to have no understanding of a good speed. His reading would make any material pure torture. No thanks, Audible! i think i might like this book, if i could hear it over the narrators freak outs and inner reluctances. i bought this book because i thought the author probably has something to say about worlds where sound is understood as the foundation of even physical reality. the window dressing is a bit more woo woo than i need, but that's okay. she's got to anchor her insights into some marketable strand of the cultural milieu, or i don't get to learn of her work. unfortunately her narrator's repeated intonations of disbelief make mattson sound like an a nut job or an idiot. and i don't think she is. it's as if he's constantly going, "ulp. do i really have to say that?!!" at first i wanted to smile and tell him, "it's okay, you can do it," like i used to do with traumatized 3rd grade readers. but freak outs get old after the first hour or so of him acting as if he can't believe what comes next. "(beginning of sentence) blah blah blah blah have?! [pause] word. word. word. ... blah blah blah? word word word. (end of sentence)" pause before next sentence. by hour 3, when something on the page is familiar and comfortable, going as normally expected, he reads smoothly, shows he's essentially literate. then she throws him a curve ball by bringing up something i want to hear about, and he's back to freak out. I thought this sounded like a really interesting book but literally as soon as the narrator started talking I couldn’t stand it! He reads as though talking to someone who is struggling to hear and understand, is so slow and it sounds as though it is the first time he’s seen the text, stumbling over words. Don’t waste any money on this audio recording-get the real book itself.